Contains a high concentration of Mineral Oil Decreased water in mixture Less dilution of dyestuff, alkalisers and peroxide Higher effective concentration of active ingredients Blondme Premium Developer contains a high concentration of Mineral Oil. This results in less water in the mixture, which may effect the dilution of dyestuff, alkalisers and peroxide. This also results in a higher concentration of active ingredients in the hair during the blonding process, which guarantees a superior shine and maximum results. What it is: The BLOND ME Lightener and Colour range provide the high performance needed to create personalized blonde looks. What it does: Premium Care Developer offer up to 9 levels of lift while the ready-to-use toners and white blending shades give endless creative potential for blonde hair. Ingredients: Aqua,Paraffinum Liquidum,Hydrogen Peroxide,Cetearyl Alcohol,PEG-40 Castor Oil,Sodium Cetearyl Sulfate,Etidronic Acid,Potassium Hydroxide,Disodium Pyrophosphate,2,6-Dicarboxypyridine,Sodium Benzoate Caution: Contains hydrogen peroxide. Avoid contact with eyes. Rinse immediately if product comes into contact with them. Wear suitable gloves. Keep out of reach of children. Follow the instructions for use carefully. Store in a cool place away from direct sunlight. For professional use only. 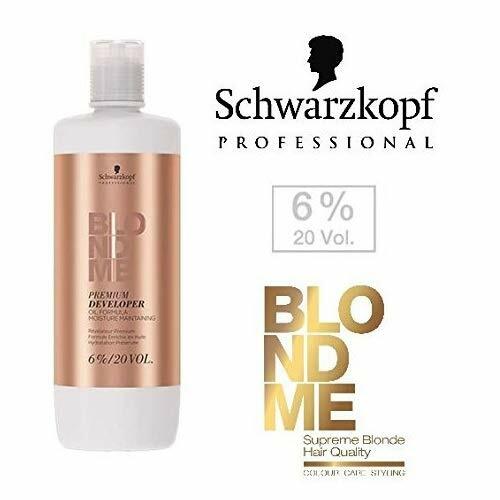 If you have any questions about this product by Blond Me by Schwarzkopf, contact us by completing and submitting the form below. If you are looking for a specif part number, please include it with your message.